Do you realize that many of our reactions to situations are caused by our fear? Fear of being vulnerable in our imperfections. The sources of those fears are varied. Statistics tell us that a large percentage of what we fear never eventuate. Often we fear a repeat of something that happened in our past; betrayal by a loved one or friend, abuses, mistakes, or disappointments. Fear has a way of paralyzing us. Love is what sets us free. The risk, as we often discover, is surprisingly worth it. The choice is ours to make. 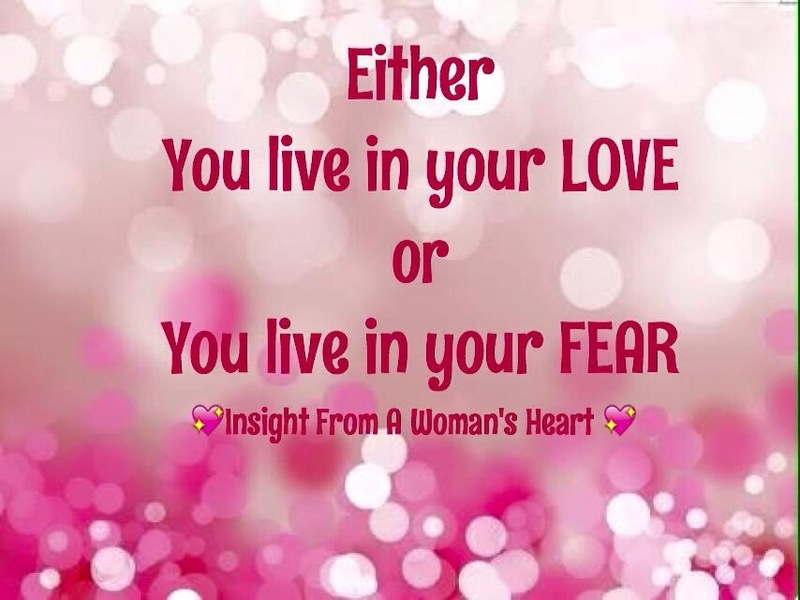 Either we live in our love or we live in our fear. Love is patient when we feel someone is being too slow in their progress of growth. Love is kind (and stern) when someone is crossing our personal boundaries. Love is gentle when someone makes a mistake or chooses poorly. Love is not whimpy or passive or weak. It takes courage to choose to work through issues. It requires bravery to commit to choose to love rather than fear; doing what is right instead of react or run.